Roar! From the time children are toddlers they make animal noises, and the “Roar!” of the dinosaur is many times one of the first (and loudest). There’s no denying it: dinosaurs fascinate kids. It’s no wonder why we have thirteen The Land before Time movies and eagerly await Disney and Pixar’s The Good Dinosaur; kids think dinosaurs are awesome. 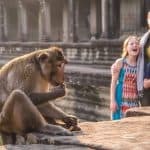 Whether it’s the size of the creatures, the thought of a time without humans, or the vast differences between what our world looks like now versus what it looked like back when, most families will find themselves with a child entranced with fossils, dinosaur play, or stories about life in the prehistoric era at some point during parenthood. To find out more about how best to help children learn about dinosaurs, as well as the features of their incredible prehistoric program, we enlisted the help of Dallas Evans, Lead Curator of Natural Science and Paleontology for one of Trekaroo families’ favorite museums, The Children’s Museum of Indianapolis. 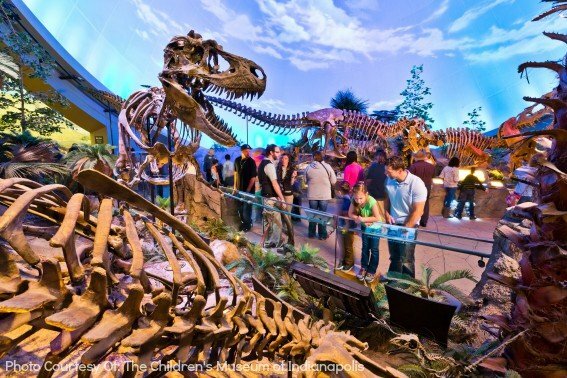 This highly-rated museum has created a plethora of ways for families to learn about and engage with dinosaurs. Here are ways to dig into paleontology while traveling on the road, close to home, or curled up on the couch. There’s no doubt that kids are in awe of dinosaurs. But, why? Dallas Evans, Lead Curator of Natural Science and Paleontology The Children’s Museum of Indianapolis shows visitors museum specimens. Families can take advantage of this window of curiosity to dig deeply into the dinosaur world. As with any subject, the more ways a child can experience the information, the better. 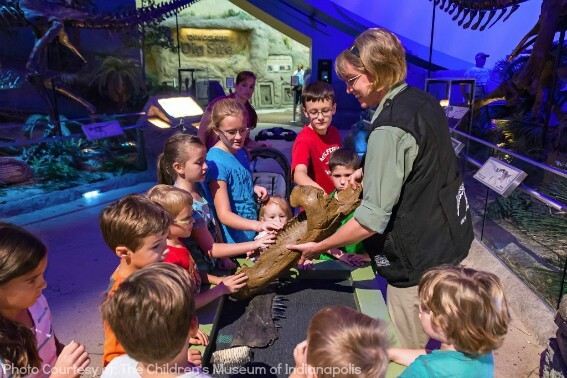 Immersing their senses in paleontology by reading about dinosaurs, seeing skeletons, touching specimens, and going to the land where they once walked will help them internalize the information at different levels. 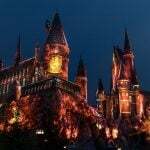 The Children’s Museum of Indianapolis, for example, offers several levels of engagement for visitors including unique specimens for families such as the Dracorex hogwartsia, a new-to-science species whose name pays homage to J.K. Rowling’s Harry Potter series, and Leonardo, a mummified dinosaur. Learning about dinosaurs is easy here with multiple levels of opportunities for hands-on learning from Q&A time with the paleontologists, and a pretend dig site at the museum. The museum also encourages family digs, homeschool, family, and school field trips, and opportunities for educators as well. While at the museum, families can implement some of these ideas to keep kids engaged at a deeper level. Size Up the Competition. When posing the kids in front of the skeleton for a photo opp, have the kids look up and really study how large the skulls, legs, and even teeth are. Verbally express the comparisons. Encourage them to show their own teeth and compare them to the dinosaur on display. Touch time. Allow them to touch any specimens they are able to. Touching makes them more real to children, especially those in the concrete thinking stage. Study the ecosystems. Give kids the opportunity to learn about what made each species unique and important to its ecosystem and place in history. What did each dinosaur eat, how can you tell, and how did paleontologists find this out? Look for the herbivores and carnivores. Discuss the history of the dinosaurs. As a family or with museum curators, talk through the history of the dinosaurs: the multiple eras in which they lived, what happened to them, and how they came to rest where they were found, and how they got on display at the museum. Bring along a journal to take notes or draw what they see. For the budding photographer, a camera will spark similar creativity and connection. Simulate a Dig. Many museums offer a way for future paleontologists to search for fossils. Ask questions to the museum staff. The curators, paleontologists, and museum staff are experts. Take advantage of being in their presence by asking questions. For curator, Dallas Evans, the most frequently asked question is whether or not the fossils are real. Show and Tell. Evans also notes that some families actually bring in fossils they’ve discovered to have them identified by the museum’s Paleo Prep Laboratory. What a great idea! Here are some of our favorite places to see dinosaurs on display in: Arizona | California | Colorado | Illinois & Wisconin | Indiana | Pennsylvania | New York |Washington DC. 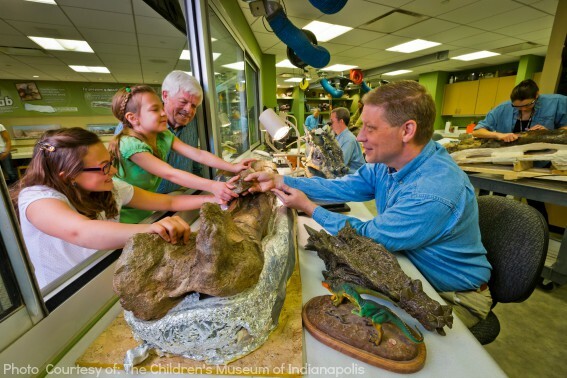 Tip: If you aren’t heading to Indianapolis any time soon to experience The Children’s Museum for yourself, Evans recommends the following as places for families to learn more about paleontology: The Mammoth Site of Hot Springs, South Dakota; the Great Plains Dinosaur Museum Field Station in Malta, South Dakota; and The Royal Tyrrell Museum of Paleontology in Drumheller, Alberta, Canada. Fossils can be found all around us. But, to find dinosaur fossils and evidence of their lives take a little more planning. Luckily, a few areas are open to the public. For those in the south, head over to Dinosaur Valley State Park in Glen Rose, Texas. Travel through the river valley and walk among dinosaur prints. (Note: call ahead of time to ask about water levels as the river can sometimes obscure the prints.) While in Colorado, take the trails outside at Dinosaur Ridge. Visitors love that they can touch the fossilized bones and see footprints. Dinosaur National Monument spans the border between Utah and Colorado. It is home to a large paleontology exhibit hall and a ranger-led tour of the fossil beds. 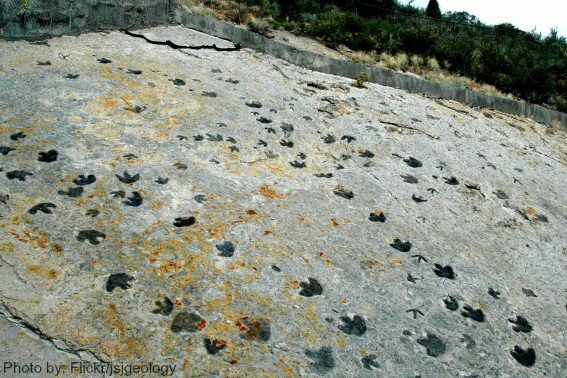 In Connecticut, families rave about Dinosaur State Park where they can make their own casts of dinosaur prints. Make an etching of the prints. If the area allows, take along a large piece of paper and some crayons or pastels to trace the prints or make an etching of them. Study the topography of the land. How did the dinosaur fossils come to be there? 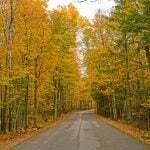 Look for signs in nature of how the area has changed over the years. Look down. Incorporate some geology. What type of rock do you see? Why would that rock allow for fossils to be preserved in them? Search for areas nearby with no fossils. 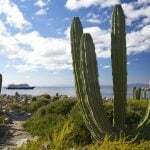 What makes those areas less conducive? Nature journal. Once again, journaling or drawing gives the brain another way to interpret and process the information. Take a few minutes along the trail to write down some thoughts about what you’re experiencing. Record your findings. In some of the programs at The Children’s Museum of Indianapolis, participants are given the opportunity to record what they see. Take this idea with you to the trail. How many foot prints did you see? What about fossilized bones? How big were they? This kind of inquiry could go on and on based on the age and developmental stage of the children. The Children’s Museum of Indianapolis facilitates family and adult-only digs in South Dakota. 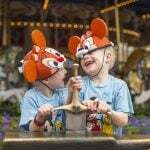 Children over the age of eight are able to participate in the uncovering and removal of duckbill dinosaurs. Not only do they get to experience this hands-on learning, but they also get information from the museum’s team of paleontologists and scientists. In addition to the program at The Children’s Museum of Indianapolis in South Dakota, there are family and youth dig programs throughout Montana and Wyoming. Museums aren’t the only place to see dinosaurs. Fun and quirky roadside attractions all across the United States feature these prehistoric creatures. Here are a few notables. 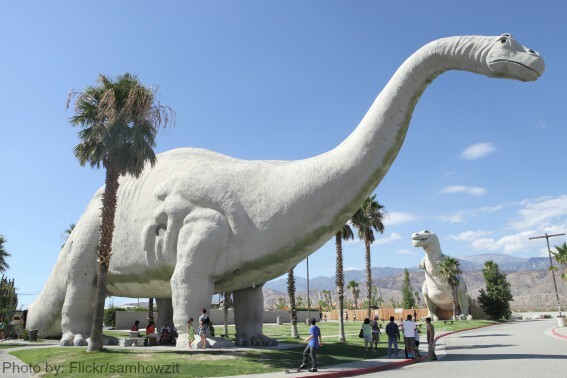 Right off of I-10 in Southern California are the Cabazon Dinosaurs. These robotic dinosaurs and accompanying museum provide a photo opportunity and a picnic area should road travelers need a rest. 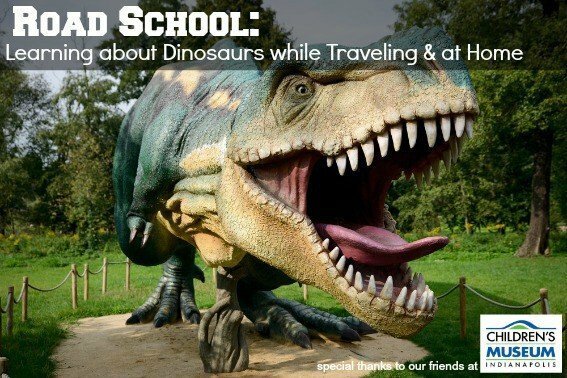 Kentucky, Texas, and Florida are home to Dinosaur World, which are theme parks home to 150 replica dinosaurs. While over along Highway 101 on Oregon’s coastline, the Prehistoric Garden offers a walk through the rainforest alongside 23 life-size dinosaurs. Make your own dinosaur fossils using clay. Bake them, hide them, hunt for them, and put them back together. Create your own etchings of fossils. Write a story about what it would be like to live during the time of the dinosaurs. Compare and contrast different dinosaur species and the environment in which they are found. Map out what the world looked like when dinosaurs roamed the earth. Need to add career information? Ask a paleontologist how they came to be in their job. How about some math? Grab a tape measure to figure out the size of the child’s favorite dinosaur. How does it differ from the child? What about weight difference between the dinosaur and child or between dinosaur and car or other animals? 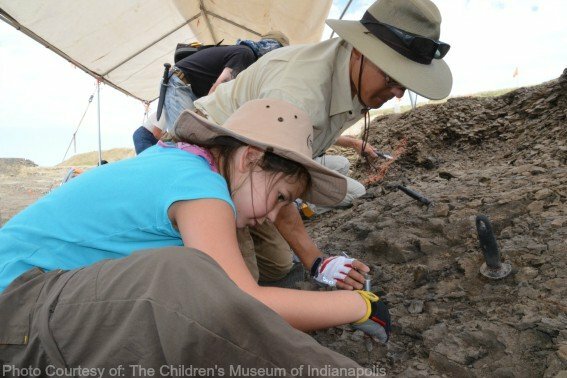 *Many thanks to Dallas Evans, Lead Curator of Natural Science and Paleontology and the staff of The Children’s Museum of Indianapolis for giving of their time to help in researching this article. I have done several of these and can’t wait to do more with my kids!